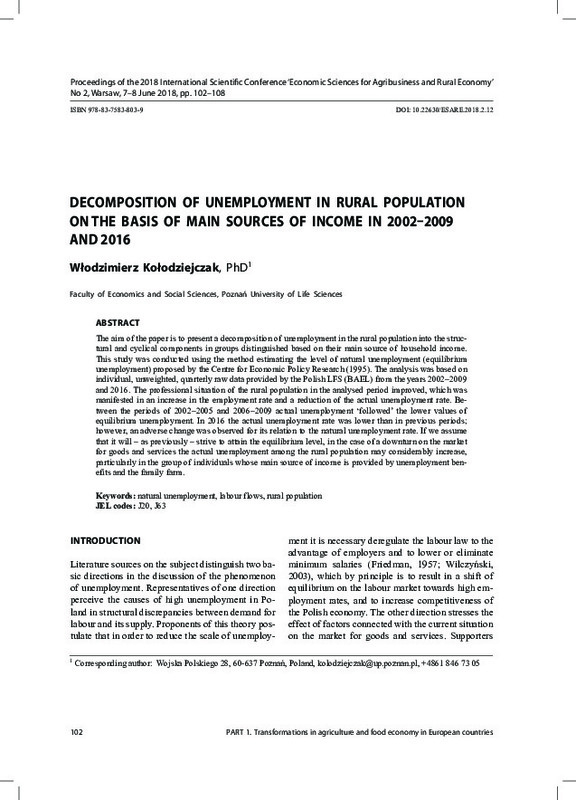 The aim of the paper is to present a decomposition of unemployment in the rural population into the structural and cyclical components in groups distinguished based on their main source of household income. This study was conducted using the method estimating the level of natural unemployment (equilibrium unemployment) proposed by the Centre for Economic Policy Research (1995). The analysis was based on individual, unweighted, quarterly raw data provided by the Polish LFS (BAEL) from the years 2002–2009 and 2016. The professional situation of the rural population in the analysed period improved, which was manifested in an increase in the employment rate and a reduction of the actual unemployment rate. Between the periods of 2002–2005 and 2006–2009 actual unemployment ‘followed’ the lower values of equilibrium unemployment. In 2016 the actual unemployment rate was lower than in previous periods; however, an adverse change was observed for its relation to the natural unemployment rate. If we assume that it will – as previously – strive to attain the equilibrium level, in the case of a downturn on the market for goods and services the actual unemployment among the rural population may considerably increase, particularly in the group of individuals whose main source of income is provided by unemployment benefits and the family farm.